Enjoy a rough and ready trip in a zebra striped four-wheel drive! You’ll head west from Montego Bay/Negril to the islands interior and discover the beauty, culture and history of this amazing country. Complete your tour with a short walk along the river where you can cool off in the natural pools while discovering hidden waterfalls! This is the only way to see Jamaica’s natural beauty and experience her culture, history and diversity. 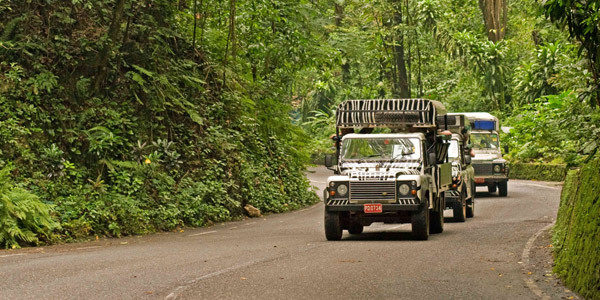 This tour will take you through Jamaica’s rugged interior in a Safari-Themed 4X4 Land Rover. You’ll be shown the real Jamaica with many pit-stops to highlight Jamaica’s local culture including a stop at a former slave hospital converted into a church in 1846. Navigate through Jamaica’s rocky terrain with your own personal guide/driver/bartender who will keep you intrigued with many stories and anecdotes about Jamaican life. To top it all off, you’ll take a once in a lifetime river walk through the tropical foliage, discover hidden waterfalls and relax in a slow, flowing natural swimming pool. Hear the birds, feel the natural mineral waters and smell the rainforest! World Travel Award 2007 – Winner for Caribbean’s Leading Nature Adventure Excursion Operator! Special Offer – Save almost 10% off the recommended retail price when travelling through December 31, 2009 – BOOK NOW! Departure Time: 9:00am – Departure times vary depending on hotel location. Exact departure times will be advised when you call to reconfirm your tour.